Learn how to create, edit and remove calendar blocks and get tips for how to best use them. A “Block” is an empty (place-holder) appointment in your calendar. It is the quickest and easiest way to make yourself unavailable for appointments for either a single time slot, or multiple time slots in a row. To create a Block, hover over the time slot in your Calendar and click the word “Block”. The time slot immediately becomes “Blocked”. You can make a Block span more than just one 30 minute slot. Because it's basically an empty appointment, editing a Block is just like editing an appointment. Click on the Blocked time and you’ll see the Edit Appointment form. From there, you can edit the length of the block, or even move it to a different time/date, if you need to. It’s even possible to write a Memo on a Block. This way, you can easily see, in your Calendar, why you’ve created the Block. If block a time slot by accident, or just want to remove a Block for other reasons, that’s easy, too. Click on the Block (as you would to edit it). Then, click “Cancel Appointment”, as you would when cancelling an appointment. Finally, here are a few things to keep in mind about Blocks. Blocks should be used for one-time or random unavailability. To set recurring unavailability (e.g. Make every Monday at 9am unavailable), use Staff Hours. You cannot place appointments over Blocks, the way you can over Offline, Away and even Closed times. This is because a Block is technically already an appointment (just a blank/empty one). If you need to convert a Block into an appointment, you should first delete the Block (as described above), then add a new appointment in its place. 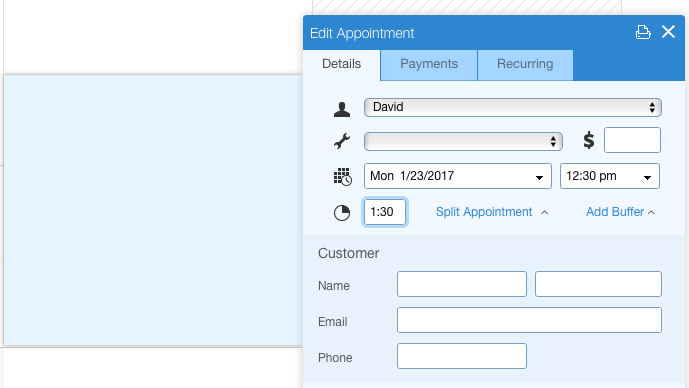 Changing an Block into an appointment by selecting a service and filling in customer details will cause problems in your Genbook account. If you are attempting to delete a staff member, you will first need to delete all future Blocks from his/her calendar.